Walking through the doorway of a magnificent Baroque church, and finding youself in a gloomy cave with water dripping on your head, has to be one of life’s most interesting experiences. The church is the Sanctuary of Santa Rosalia. 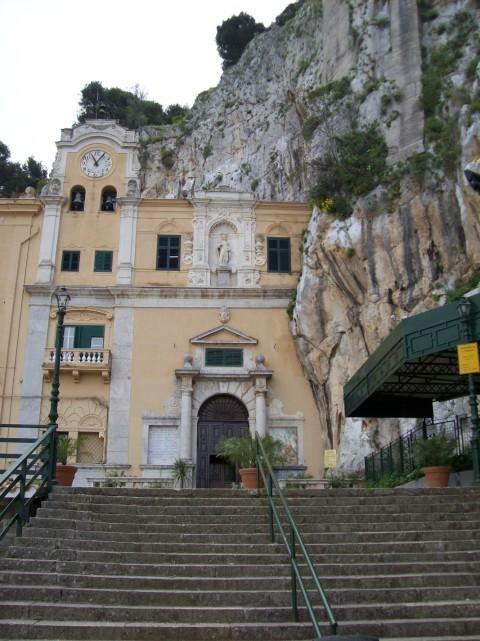 It stands at the very top of Monte Pellegrino (Pilgrim’s Mountain), which overlooks the whole bay of Palermo. Palermo used to have four patron saints, but they were all fired for incompetence when the city suffered a prolonged epidemic of the plague which they could not cure. They were replaced by Rosalia, who did cure it. 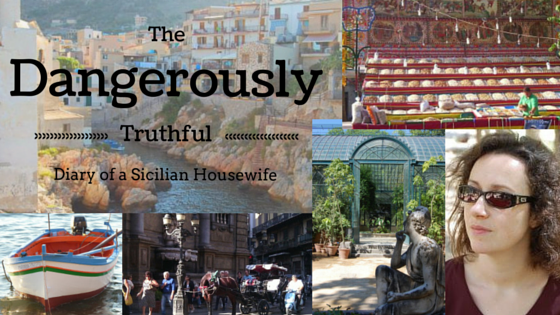 The people around Palermo still affectionately call her La Santuzza, which means “the cute little saint”. I suggested climbing up Monte Pellegrino on my first ever date with my husband. I fancied going up there because I like climbing mountains. What I did not know was that Sicilians only climb up Monte Pellegrino for one reason; to make a religious pilgrimage. Of course! There could be no other reason why an Italian would risk scuffing his shoes. By the time hubby-to-be and I were ready to set off, word had spread around his entire extended family that I was not only beautiful, educated, spoke good Italian and even had blue eyes – all of which are highly commendable qualities in equal measure to Italians – but was also so very devout that I had insisted on making a pilgrimage to their very own saint. A large posse of relatives had assembled to see us off at the foot of the mountain. The Godmother, my Mother-in-law-to-be-if-only-I-knew-it, brought me a set of rosary beads as a gift. The long climb up passed very pleasantly, since I was in a fabulous state of fitness at the time. It is a two hour hike if you go at it hell-for-leather. If I tried it now, I would need several days, and paramedics following me all the way, and would probably die anyway before I reached the top. The terrain changes as you gain altitude. The plants are mainly prickly pear cactuses lower down and a Mediterranean variety of broom as you get nearer the peak. Artistically placed rocks lie about all over the place and make it look almost like a giant garden, almost too perfect to have been left simply to nature. Sometimes you see an emerald green lizard flashing in the sunlight as it darts across a rock in hot pursuit of some tasty-looking insect or other morsel on the run. When you arrive at the very summit of the mountain, you are faced by a magnificent baroque facade. Then you walk through the door, into a cave. 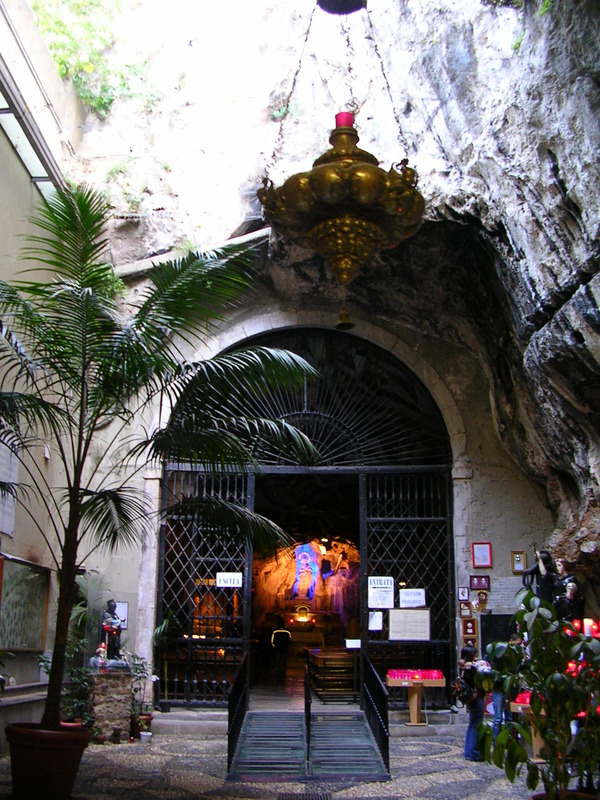 Before you reach the main part of the church, or sanctuary as it is officially called, you walk through the craggy (and less drippy) entrance, which holds a statue of Rosalia. Here, people leave votive offerings, thanking her for wishes she has granted. They are so numerous that the priest has constantly to remove them. She is festooned with little arms and little legs, and miniature kidneys or other internal organs, specially crafted out of silver by people who have survived illnesses or injuries. She has thick sheafs of hand-written thank-you letters wedged in her hands. She often has a motorbike crash helmet at her feet, left by yet another young man who has thankfully survived a near-fatal accident by praying to her desperately, while lying in the road waiting for an ambulance. She is also sometimes draped with jewellery and other valuables. Some of the offerings are outstandingly previous, and are placed in glass display cases. There are pearl and ruby necklaces, antique earrings and other jewelled objects, and there is a complete ship about three feet long made of solid gold and encrusted with precious gems. 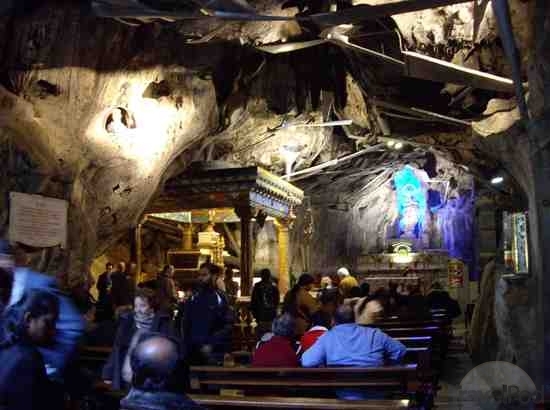 Beyond this area, the main body of the church really is a very bat-cave-like place. Water drips constantly off the ceiling and is channeled by hundreds of brass guttering tubes, suspended from the ceiling at all angles in a crazy meleé that looks like a modern art installation. Members of the congregation sit beneath them during mass, and periodically wipe themselves with hankies when an occasional stray drop splashes them. 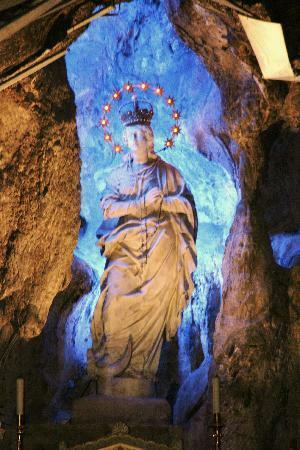 The statue of Rosalia that takes pride of place in this mountain-top sanctuary follows the iconography created by Van Dyck, who happened to be in Palermo when plague broke out. 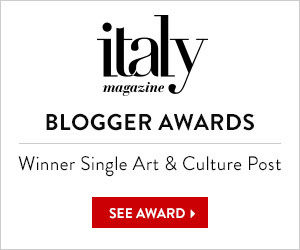 Like everyone else in Palermo, was quarantined and banned from leaving. The statue is made of gold and white marble. Rosalia reclines, holding her own skull in her hand, and a pick axe for hacking her way through rocks in the cave. Why the skull and the pick axe? I’ll tell you the story of Rosalia’s life in my next post. I have only found very brief versions of events online but, in Palermo, the oral tradition is detailed and exciting and always, infallibly, told with deep affection for the Santuzza. I AM ON HOLIDAY IN ENGLAND TILL THE END OF THE MONTH. I’M LOOKING FORWARD TO SEEING YOUR COMMENTS AS SOON AS I CAN GET ONLINE! By the way, I have just discovered that WordPress is putting advertisements on my blog to cover the cost of the free hosting they provide me. I don’t like ads at all, but I suppose that’s fair enough, and I hope they don’t annoy you too much. I remember seeing this as a child and my parent’s telling me that she was so loved the townspeople clothed her in gold. I think this is well worth the hike and your narration as usual, beautiful, funny, and spot on. Thank you so much! It’s true that she is genuinely adored by the people of Palermo to this day. Rosalia is still one of the most popular girls’ names in Palermo for the same reason. I know! Very cool, isn’t it? The feel inside the church is absolutely staggering! What a great description. I look forward to the Saint’s life story. One of my favorite books in Catholic grade school was a children”s version of “Lives of the Saints” – full of gory, improbable but fascinating tales. That sounds fascinating. I am often surprised at how little my husband or his friends seem to know about the lives of the saints. I had assumed being Catholics, they would know a lot…. apparently they need that little book! such a sweet story! and so much lovely history! Why the skull and the pick axe? The skull is her own, as her bones were what were brought into Palermo and stopped the plague. The pick axe was a symbol of her cave-dwelling life, hacking out shelters for herself in the caves and Mountains. On a vacation in 1962, at the age of 19, I made the climb to Monte Pellegrini with my mother. I remember the cobblestones on the way up being very worn down and concave. I was told that it was due to the many who crawled up on their knees hoping for a blessing from St. Rosalia. 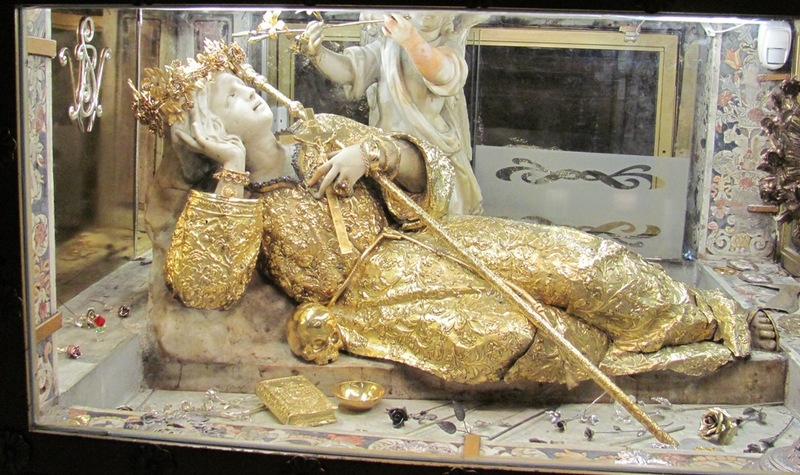 When inside, I remember a statue of St. Rosalia encased in a glass enclosure. She was draped with many jewels, letters, from those that gave thanks. Most of all, I remember the many crutches that were hanging on the walls. These were from the many loving devout pilgrims who were now able to walk back down the mountain cured from her blessings. I wear her medal around my neck since that day. I am now 72 and young!! Excellent!! I went there with my husband christmas 2016,i didn’t know her before even though i like reading lives of the saints now i have her picture in my house.Glad to know a few things about her. Well written and informative for a traveler who wants a brief run down.